Well, Josh did it. He convinced Emily to revisit the dungeon and bring some tracks of her own, but she also brought some other stuff that maybe he hadn't counted on. Eavesdrop on their hangout and enjoy their selections! Get back into the swing of things at the usual jukebox gathering as Josh and Emily cue up a fresh batch of suggestions, construct a few more elaborate tune-inspired vignettes, and even coin a new term for the listeners. This episode has quite a bit of console variety to it, too. Enjoy! Patrons! Donate your favorite tracks! No way! Josh and Emily discover a continue marker on the way to episode 10 and warp into a Special Stage! Instead of playing track selections they decide to spend this unusual episode discussing childhood gaming memories, gaming accomplishments, and how VGM soundtracks factor into their daily lives. Whether or not this is worth tuning in for is up to the listeners, but remember that you're free to leave this episode at any time. It's only a bonus stage, after all! We'll be back to our usual format next week. See you then at The VGM Jukebox! In this installment, a couple of listeners show us that gaming is a family affair with their nostalgic testimonials. A listener lends us his voice, and the hosts date themselves by referencing Tamagotchi and Napster. Emily reads a translation of psuedo-Latin poetry and we get a visit from the Carrot Man. No big. Just another regular evening at The VGM Jukebox. Keep those track suggestions coming! This episode of the VGM Jukebox is 100% powered by listener suggestions! Drop in and jam out to a setlist that includes tunes from systems never before featured on the podcast, then marvel at our listeners' various meat-related monikers. 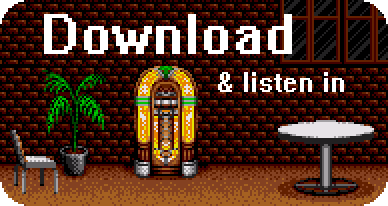 The VGM Jukebox is now on iTunes! The jukebox always wants more track suggestions. Got a tune in mind? Pick a way to contact us! *Note: This track was officially credited to Mamoru Samuragochi, but it's now known that Samuragochi had commissioned other musicians to compose his work. Josh and Emily address this controversy during the episode. Josh and Emily serve up some dramatic listener suggestions for this very intense episode. Join them as they discuss death, valor, and little girls’ tea parties. The jukebox has been getting some great video game track suggestions, but it needs more! Got a tune in mind? Pick a way to contact us! Josh and Emily reconvene at the VGM Jukebox, pick out a few more favorite tracks, and meander into a discussion on Parliament-Funkadelic (among other things). Emily regrets accidentally ruining Josh's attempt at live freestyling, but she'll do her best to coerce him into another attempt in a future episode. The jukebox needs video game track suggestions from listeners like you! Got a tune in mind? Pick a way to contact us! *Corrections: when Josh says that Dota Ando composed the music for Hal's Hole in One Golf, he should have said, "Okamoto Match Play Golf," which is a totally different game.